In this book chapter, Orthopaedic Surgeons Steve A. Mora MD, Bert Mandelbaum MD, and William Meyers focus on major problems involving hip and groin injuries in the athlete. Topics cover soccer injuries, sports hernia, pubalgia, groin strains, hip arthroscopy, etc. This chapter is part of a greater body of work in the textbook Edited by Dr. Johnson and Dr. Mair. Tailored for today’s busy clinician, Clinical Sports Medicine provides hands-on information for the management of both recreational and competitive athletes. Over a thousand full-color clinical illustrations plus a wealth of summary boxes enable you to obtain key information quickly, while authoritative text written by established and emerging authorities provides state-of-the-art know-how on overcoming any challenge in the specialty. 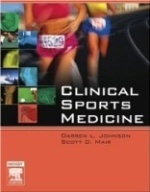 Coverage of sports injuries includes structured information on diagnosis, management, and rehabilitation.